Objective: Lack of consensus on when to diagnose and manage retained placenta in the absence of hemorrhage in the 3rd stage of labor, has often subjected Manual removal of placenta (MROP) to the discretion of the accoucher. This study aimed to appraise the practice of manual removal of placenta in a tertiary institution in Nigeria with a view to evaluating risk factors for the procedure and advance probable guidelines to enhance standardization of diagnosis of retained placenta. Design: Case controlled study. Setting: Tertiary maternity center in South west Nigeria. Participants: Data from the hospital records of 92 parturients who had MROP from January to December 2009 were compared with 91 immediate next parturients without MROP matched for age and parity. Variables such as the past obstetric and gynecological history, status of accoucher, gestational age at delivery, duration of 3rd stage, estimated blood loss, quantum of blood transfused and length of hospitalization were extracted and subjected to statistical analysis using the SPSS package. Results: There were 4613 deliveries of which 92 parturients had MROP, an incidence of 1.99%. The mean duration of 3rd stage in the study group was 35.6 ± 18.8 minutes compared to 21.6 ± 6.28 minutes in the control. Doctors were the accoucher in 96.8% of cases while midwives took the deliveries in 84.4% in the control group. Previous scarring of the pregnant uterus such as dilatation and curettage and caesarean section predisposed to MROP compared to the control group (P < 0.032) and (P < 0.024) respectively but there was no significant difference between the two groups with respect to previous myomectomy. Conclusion: There is a need to establish standard guidelines in the management of the 3rd stage of labor with definite criteria for diagnosis of retained placenta to reduce the probable risk of unnecessary MROP. Manual Removal of Placenta is a common obstetric procedure performed in the third stage of labor as treatment of the retained placenta when it is undelivered for more than 30 mins, according to the World Health Organization (WHO) . Manual removal of placenta is advised at anything between 20 minutes and over 1 hour into the third stage [2,3]. The choice of timing is a balance between the post-partum hemorrhage risk of leaving the placenta in situ, the likelihood of spontaneous delivery within 60 minutes and the knowledge from caesarean section studies that the manual removal itself causes haemorrhage [4,5]. However spontaneous expulsion after 60 minutes is very rare [1,4]. Retained placenta is a potentially life-threatening condition and a common cause of maternal death from postpartum hemorrhage (PPH) [5,6]. It affects 0.5% - 3.3% of women following vaginal delivery [4,5,7,8]. Hemorrhage during pregnancy, birth or postpartum period is said to account for 25% of maternal deaths in Africa and South east Asia countries. About 15% - 20% of these maternal deaths from post partum hemorrhage are due to retained placenta which will require manual removal of placenta compared with normal delivery of placenta [6,8,9]. Retained placenta is the second major indication for blood transfusion in the third stage of labor . A number of observational studies on vaginal deliveries have shown an association between the length of 3rd stage of labor and the incidence of post-partum hemorrhage [11-13], this association does not necessarily imply causality. Occurrence of maternal morbidity and mortality from retained placenta has been linked to the non availability of skilled birth attendants to perform manual removal of placenta immediately when indicated in developing countries [5,7,8 ]. An evaluation of practice in various maternity units in different European countries regarding policies on how long clinicians should wait before removing placenta manually, in cases where the woman is not bleeding, revealed a lack of consensus [2,13]. Risk factors identified for the occurrence of retained placenta include previous history of retained placenta, preterm delivery [8,14], previous uterine scar, age above 35 years and grand multiparity [5,14]. Although there are various methods of removing retained placenta like use of systemic oxytocics such as prophylactic oxytocin injections, ergometrine, misoprostol, umbilical vein oxytocin injection, diluted Saline among others, these were not found to be effective in randomized control trials [1,15-17,18-21] though there is a strong argument now in favor of umbilical vein oxytocin injection . Complications of manual removal of placenta include bleeding, infections, genital tract trauma, uterine perforation, uterine inversion and risks associated with type of anesthesia used [19-21]. There was no stated departmental guideline on the performance of Manual removal of placenta in our center. This study was therefore undertaken to evaluate the incidence of retained placenta, the indications for performing manual removal of retained placenta, assess the risk factors that predisposed parturients to manual removal of placenta and the complications of the procedure with a view to making recommendations. This study was conducted in the maternity wing of the Lagos State University Teaching Hospital. The research and ethics committee of the institution approved the study protocol. 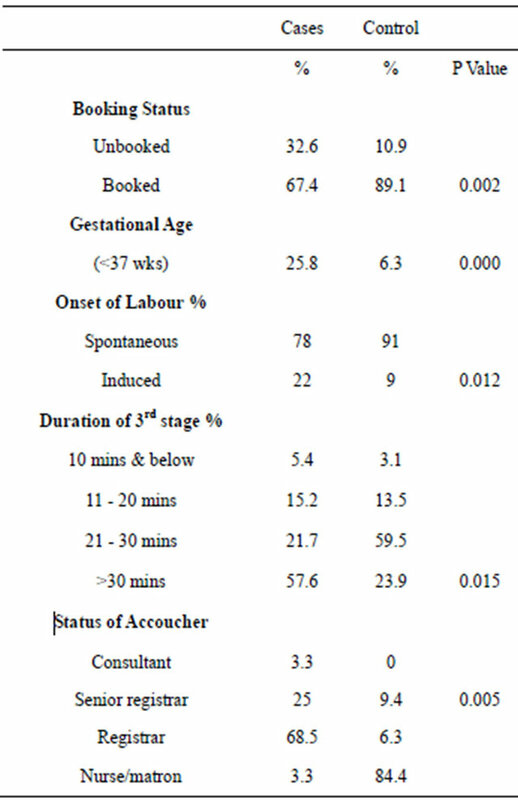 All patients who delivered on the labor ward from the 2nd of January to 31st December 2009 and had manual removal of placenta following normal delivery were recruited for this study. Ninety two parturients had manual removal of placenta and were matched against the immediate next parturients with spontaneous placental delivery on the labor ward register as control. A specially designed proforma was used to obtain data from the labor ward records, delivery notes, theatre records and patients’ case notes. Information sought included socio demographic data such as age, educational status, occupation, booking status, gestational age at delivery, type of labour, history of previous dilatation and curettage (D & C), caesarean section, myomectomy, status of accoucher, indication for MROP, estimated blood loss (EBL), duration of hospital stay, blood transfusion, and any complications suffered. All parturients on the labor ward had active management of the 3rd stage of labour [1,22]. The placenta was adjudged to have been retained if undelivered 30 minutes after delivery of the infant or failure of controlled cord traction. Packed cell volume was routinely estimated 48 hours after delivery in all paturients, and 48 hours after blood transfusion whenever necessary. Data were analyzed using statistical package for social science version 16.0 (SPSS version16 Inc., & Chicago II, USA). Student-t-test and Pearson’s chi square tests were used in the comparison between 2 groups as appropriate. Multiple logistics analysis was used to determine independent associated factors, odd ratio and 95% confidence interval were estimated. A p-value of 0.05 was considered statistically significant. During the study period, 92 women had retained placenta which were manually removed. The total number of deliveries was 4613 making the incidence of manual removal of placenta 1.99%. There were 91 suitably matched immediate next parturients who did not have retained placenta and served as control. Table 1 shows the comparison of cases and control using their socio-demo graphic characteristics, The mean age of the study group was 31.2 SD 5 while that of the control group was—29.1 SD 4—(P = 0.156), Women who were aged 35 years and above made up 18.5% of cases while they constituted 7.7% of control group. Similarly there was no significant difference between the two groups with respect to the occupational status and parity in which P values are 0.292 and 0.209 respectively. Table 2 Illustrates the pattern of past obstetric and gynecological characteristics among the women studied. 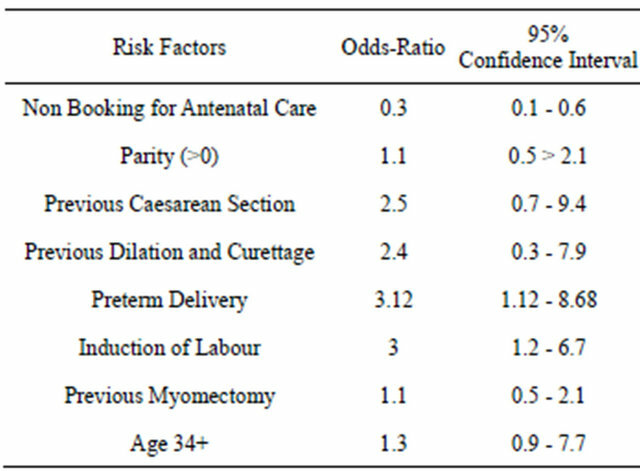 There was a significantly higher number of women with history of previous dilation and curettage (P < 0.032) and previous caesarean section (P < 0.024) among the cases compared to the control group, but no significant difference between the two groups with respect to previous myomectomy. The distribution of present obstetric and intrapartum characteristics of the cases and control is shown in Table 3. There were statistically significant differences in the number of women who were unbooked for ANC with a P value of 0.002 and those that had preterm delivery with a P value of 0.000. Labour was induced in 22% of the study group compared to 9% in the control (P = 0.012). In 19.7% of patients who had manual removal of placenta, the 3rd stage of labor lasted less than 20minutes, it lasted over 30 minutes in 57.6% compared to 23.9% of the control group in whom it exceeded 30 minutes .The mean duration of 3rd stage was 35.60 ± 18.38 mins in the study group while it was 21.60 ± 6.28 minutes in the control group (P = 0.015). Delivery was conducted by doctors in 96.8% of the parturients who had manual removal of placenta compared to the control group in which 84.4% of delivery was conducted by midwives (P = 0.005). Table 4 shows the complications associated with manual removal of placenta. 19.5% of the study group had a significantly higher rate of primary PPH compared to 4.7% the control (P = 0.001). 29.9% of .the study group received significantly more blood transfusion than the 4.6% of the control group (P = 0.008). In the study group 14.4% had I pint 11.1% had 2 pints and 4.4% had 3 pints. It was shown that the duration of hospital stay in the study group was longer compared to the control where. 58.7% of the study group spent >5 days before discharge compared to 36% of the control. Table 2. Pattern of past obstetric and gynecological characteristics of 92 cases and 91 controls. Table 3. Distribution of present obstetric and Intrapartum characteristics. Table 4. Complications associated with MROP. MROP = manual removal of placenta; PPH = post partum hemorrhage. association with an increased risk for having manual removal of placenta, previous myomectomy, age, parity, were not significantly associated with manual removal of placenta. The third stage of labor refers to the interval from the delivery of the baby to the separation and expulsion of the placenta. One of its major complications is retained placenta, a major contributory factor of postpartum hemorrhage and uterine inversion. Manual removal of placenta is the commonest effective treatment for retained placenta and is usually done under anaesthesia . The incidence of manual removal of placenta in this study was 1.9%, which tallied well with the reported incidence of 0.6% - 8% [5,7,23] from both within the sub region and elsewhere [4,8,14]. There were no maternal deaths attributable to retained placenta in this study which might be a reflection of early and appropriate response to the management of retained placenta . Doctors were the accouchers in 96.8% in the study group compared to 15.7% in the controls (P = 0.005), it might seem that delivery by the doctor in this study was a risk factor for manual removal of placenta. It is conceivable that the doctors resorted to manual removal of placenta because they diagnosed retained placenta much earlier than prescribed [1,3,4] as was done in 41.4% of the parturients within 30 minutes of delivery of the baby. This observation is even more striking when juxtaposed against the control group in which 84.4% of the women delivered by midwives had spontaneous placental delivery as against only 3.3% who had manual removal of placenta. Table 5. Logistics regression analysis of risk factors for retrained placenta. 4.6%. Manual removal of placenta as a procedure is associated with increased hemorrhage [4,5]. There is no evidence that, in an uncomplicated delivery without bleeding, interventions to accelerate delivery of the placenta before the traditional 30 to 45 minutes will reduce the risk of PPH [2,22] and should be discouraged. The unbooked patient was at greater risk of undergoing manual removal of placenta compared to booked patients 32.6% to 10.9% (P = 002) in tandem with findings by other authors [4,5,7,23] but higher than 8.01% described by Soltanand Kashogi  who employed similar criteria of recruiting only patients delivered on their labor ward. The difference cannot therefore be attributed solely to the mismanagement of the 3rd stage of labor before arrival as in the earlier studies. Preterm birth was also associated with a significant risk of manual removal of placenta (OR 3.12 95% CI 1.12 - 8.68. P < 0.000) as was induction of labour (OR 3.0 95% CI 1.2 - 6.7).in keeping with 3 - 9 fold increase reported by Soltan and Kashogi  Titz , and might be due to the fact that the risk factors such as infarcts and fibrinoid degeneration of decidual arterioles and acute arteriosclerosis which often accompany preterm labor, stillbirth and intrauterine growth restriction also result in abnormal adherence of the placenta and might be less likely with spontaneous labour . It has also been suggested that the preterm placenta covers a relatively larger uterine surface than the term placenta and as a result, expulsion of the preterm placenta may require more uterine work and time, predisposing to retention . Previous surgery on a pregnant uterus was associated with more than 2 fold risk of undergoing manual removal of placenta, this relationship was not observed with previous myomectomy scars and agrees with findings by other authors [8,23]. It has been postulated that the factors which caused injuries that led to deficient or damaged endometrium, predispose to abnormal placentation wherein the chorionic villi penetrate into the uterine muscles. This penetration of the endometrium and the uterine muscles might therefore predispose to placenta retention . The age and parity of the patients were not significantly associated with manual removal of placenta in this study probably because the subjects were matched for age and parity at recruitment. 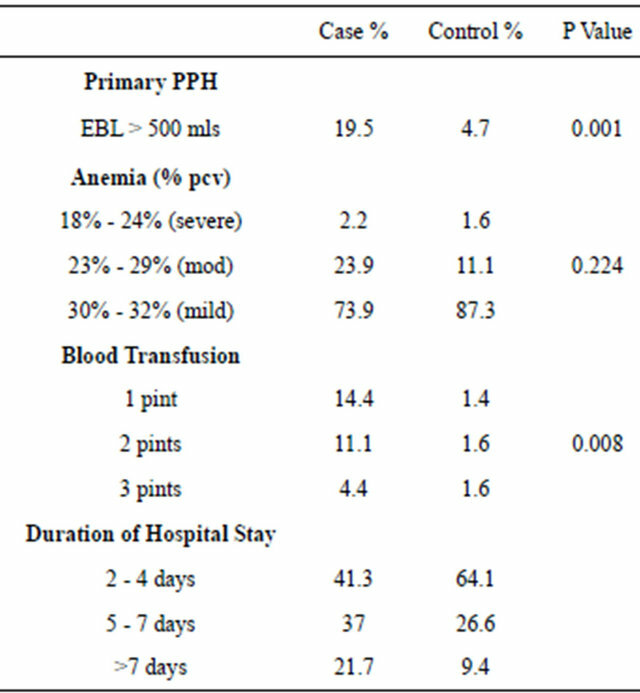 The longer duration of hospital stay in the study group might have resulted from implications of blood transfusion such as post transfusion laboratory investigations like packed cell volume which was routinely done after 48 hours and increased cost, delayed payment which paradoxically further delayed discharge. The limitation of this study was its retrospective nature whereby independent variables such as whether labor was induced, exact indication for the manual removal of placenta , type of analgesia in labor, size of the placenta and other such factors that were evaluated in other studies  could not be accurately extracted because of inadequate record keeping. However, the need to either formulate institutional guidelines or adopt existing guidelines as to when to diagnose retained placenta and proceed to manual removal of placenta cannot be overemphasized as this might have a significant effect on reducing the incidence of unnecessary manual removal of placenta. It is recommended that in the absence of hemorrhage, an observance of a 30 minutes wait after the delivery of the fetus be adopted regardless of the outcome of controlled cord traction to await spontaneous placental delivery before proceeding to its manual removal. National Collaborating Centre for Women’s and Children’s Health (NCCWCH) (2007) Intrapartum care, care of healthy women and their babies. NICE Clinical Guidelines. Obajimi, G.O., Roberts, A.O., Aimakhu, C.O., Bello, F.A. and Olayemi, O. (2009) An appraisal of retained placentae in Ibadan: A five year review. Annals of Ibadan Postgraduate Medicine, 7, 21-25. Etuk, S.J. and Asuquo, E.E. (1997) Maternal mortality following post-partum hemorrhages in calabar a 6-year review. West African Journal of Medicine, 16, 165-169. Daftary, S.N. and Nanawati, M.S. (1996) Management of postpartum hemorrhage. In: Buckshee, K., Patwardhan, V.B. and Soonawala, R.P., Eds., Principles and Practice of Obstetrics and Gynecology for Postgraduates. FOGSI Publication, Jaypee Brothers Medical Publishers, New Delhi. Kamani, A.A., McMorland, G.H. and Wadsworth, L.D., (1988) Utilization of red blood cell transfusion in an obstetric setting. American Journal of Obstetrics & Gynecology, 159, 1177-1181.
International Confederation of Midwives, International Federation of Gynecology and Obstetrics (2004) Joint statement: Management of the third stage of labour to prevent post-partum hemorrhage. Journal of Midwifery & Women’s Health, 41, 76-77. Winter, C., Macfarlane, A., Deneux-Tharaux, C., Zhang, W.H., Alexander, S., Brocklehurst, P., et al. (2007) Variations in policies for managing of postpartum hemorrhage in Europe. BJOG, 114, 845-854. Prendiville, W.J., Elbourne, D. and McDonald, S. (2009) Active versus expectant Management of the third stage of labor. Cochrane Database of Systematic Reviews, 8, CD- 000007. Pigingas, A., Hofmeyr, G.J. and Sesel, K.R., (1993) Umbilical Vessel Oxytocin Administration for retained placenta: In-vitro study of various infusion techniques. American Journal of Obstetrics & Gynecology, 168, 793- 795. Thomas, W.O. (1993) Manual of removal of placenta. American Journal of Obstetrics & Gynecology, 86, 600- 606. Oshodi, Y.A., Akinola, O.I., Fabamwo, A.O., Oludara, B., Akinola, R.A. and Adebayo, S.K. (2012) Ruptured uterus and bowel injury from manual removal of placenta: A case report. Nigerian Postgraduate Medical Journal, 19, 181-183. Leduc, D., Senikas, V., Lalonde, A.B., Ballerman, C., Biringer, A., et al., Clinical Practice Obstetrics Committee; Society of Obstetricians and Gynecologists of Canada (2009) Active management of the third stage of labor: Prevention and treatment of postpartum hemorrhage. Journal of Obstetrics and Gynaecology Canada, 31, 980- 993. Owolabi, A.T., Dare, F.O., Fasuba, O.B. Ogunlola, I.O., Kuti, O. and Bisiriyu, L.A. (2008) Risk factors for retained placenta in Southwestern Nigeria. Singapore Medical Journal, 49, 532-537. *Funding: The authors declare no interests as the study was conducted without funding from any interest group.